Church of Scientology Las Vegas Takes to the Streets! – OTVIIIisGrrr8! Church of Scientology Las Vegas Takes to the Streets! The panicked call came into the Church of Scientology’s Office of Special Affairs: SP’s are meeting in Las Vegas to have fun! 1. Exert local area PR control in Las Vegas by showing how the Church is flourishing and prospering. 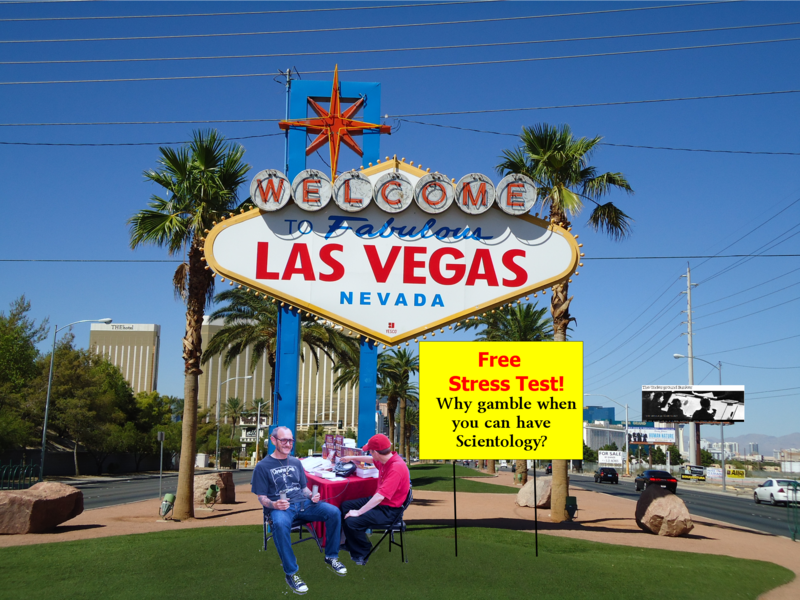 Marshaling all five Las Vegas Scientologists still in good standing, a stress test table was set up. Initial reports from Saturday indicate that one raw meat wog took a free stress test and purchased a book. Target for Sunday is two wogs. Tagged as: church of scientology, Las Vegas, Office of Special Affairs, OSA, OTVIIIisGrrr8! I landed in Las Vegas Friday afternoon and felt the enturbulation upon my arrival. This was confirmed when I lost the $18,000 I had intended to donate to the IAS at the airport slot machine. I will be going to the org this afternoon to donate the rest of my money later today if the slot machines don’t claim it first. Vegas airport slot machines? Noooooooooooo Skydog No! Even the most dead in the head wog knows Vegas airport slots are more rigged than even an IAS fundraiser! That $18,000 could have purchased 47% of a Cornerstone Membership! How many came trying to unload crates of the BASICS? Mrs. Skydog was pretty pissed too but I told her that I was the authority on gambling and to STFU. Theta controls MEST so it was the entheta, not the odds that emptied my kid’s college fund not the rigged slot machines. What Skydog said. COB has spent hundreds of millions of dollars on slot machines called Ideal Org that have yet to payoff. The why is SP’s in or around the Ideal Orgs. The handling is more sec checks and SP Declares. I think I have an MU on the word “fun”. I recall an LRH statement; “If it isn’t fun, it isn’t $cientology”. So, did the SPs arrive in Las Vegas to do $cientology?